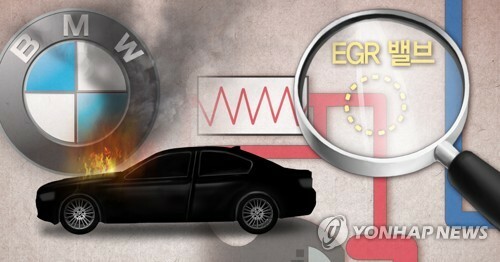 SEOUL, Nov. 7 (Yonhap) — The main cause of engine fires in BMW cars turned out to be faulty exhaust gas recirculation (EGR) valves, not EGR coolers and pipes as claimed by the German carmaker, a local investigation’s interim findings showed Wednesday. The public-private investigation team led by the Korea Transportation Safety Authority (KOTSA) tested BMW cars under three scenarios replicating actual driving conditions. The first tested for leakage in the EGR cooler, with the second involving the EGR valve left open and the car driven at high speed. Finally, the KOTSA turned on the diesel particulate-nitrogen oxide reduction system to see if it could cause a fire. The team’s tests showed that deposits caused by EGR cooler leakage, when exposed to high-temperature exhaust emissions flowing in through EGR valves, triggered sparks inside the engine compartment. The spark sometimes grew when exposed to air in high-speed driving conditions, which resulted in a hole in the induction system. This, KOTSA argued, can lead to a fire in the engine room. In response, BMW said the whole EGR module system that includes coolers, pipes and valves is subject to its planned recall of 106,317 vehicles by the end of this year. “EGR valves are not the main cause of recent fires in BMW cars but part of the conditions that caused engine fires,” BMW said in a text message sent to reporters. BMW has argued the faulty EGR coolers and pipes are the “root cause” of dozens of engine fires this year. The investigation team is expected to come up with final results next month.